As we have already seen above, autotrophic organisms can synthesise their own substance from a source of mineral carbon that can be carbon dioxide, HCO3-, and even methane in the case of those rare organisms that live in an anaerobic environment. For heterotrophic organisms, the main nutritive substrates belong to the following three categories: glucides, protides and lipids. Glucides were once called “sugars” due to the taste of their simpler forms, or were called carbohydrates because they match the general formula Cm(H20)n. Due to their abundance in vegetable tissues, they constitute the normal food for heterotrophic organisms. They exist in non-hydrolysable forms (monosaccharoses such as glucose) and in hydrolysable forms (glycosides such as starch, cellulose and glycogen). Protides, which are the most important components in living matter, form the basis for cytoplasm material. They consist of an assembly of simple substances: amino acids. 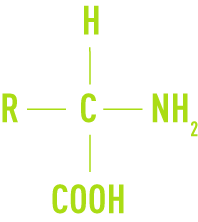 An amino acid is a substance that has one or more acid grouping COOH in its molecule and one or more NH2 amino groups bonded to the same C atom. Protides behave like acids or bases, depending on the pH level of the medium they are placed in. The acid and amine functions can be fixed to each other and form long-chain macromolecules with a molecular weight that can reach high values (50,000 or more). Depending on this mass, a distinction may be drawn between peptides, simple proteins and conjugated proteins. Lipids, whether simple or complex, are fatty acid and alcohol esters with a greater or lesser degree of complexity. They are generally insoluble, but can emulsify in water. In both vegetable and animal life, they constitute important reserve material for covering energy needs. Under certain conditions, heterotrophic organisms can adapt to the consumption of other organic substrates such as alcohols, phenols, aldehydes, hydrocarbons, etc. In additional to the nutritive substances mentioned above, the growth of bacterial organisms (autotrophes and heterotrophes) requires the presence of essential mineral elements, some of which are in trace form. They have a range of roles in the cell (structure, metabolism), but phosphorus mainly plays a role in the energy storage and release mechanisms. This energy reserve is found in the P - P bonds that exist in particular molecules: adenosine mono-, di- and tri-phosphates ( AMP, ADP, ATP ). Strictly speaking, trace elements are mainly metals. Concentrations of about one microgramme per litre in growth media are quite sufficient, but are essential for meeting cell needs. These elements quickly become toxic at higher content levels. They control numerous phenomena in the cell, such as the transmembrane ion gradient (Na+), and they also play a part in structuring certain macromolecules associated with enzyme complexes. The need for these elements is shared by all groups of bacteria, but certain of them are quite specific to given families of bacteria. Thus, nickel is specifically linked to the enzymes that control the methylation of acetate in methanogenic bacteria and is therefore essential for the proper functioning of methane fermentation.